…. not sure why its called “kamala orange” in tamil. 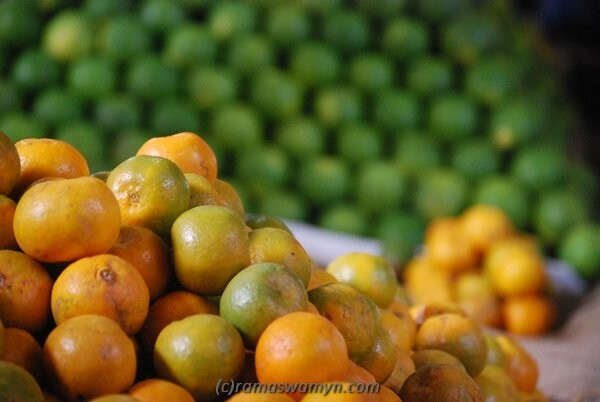 This fruit’s seasons on @ Koyambedu. Kamala derives from Kamal meaning Lotus. Traditionally an intense yellow natural colorant is obtained from fine powdered resin collected from the hairs of the fruit from a lotus tree. And its technically called ‘Resina Kamala’ even today! I think now I see the connection! Ram : Thanks GS for the direction to look for…. Also, a more direct reasoning…I am now looking at images of lotus flower.. Never really looked inside.. and surprised to note the color of the inside. Oh my, fresh fruit! Sometimes I miss that, and of course, dosa. Andhra Pradesh might have been named Kamala pazham just like Banganapalli (mango). But how Kamala came into Telugu, your explanation is apt. I was told by someone recently that there are many dye (colour) making units in Andhra.